In order to manage the sea successfully all Baltic Sea scientists need to relate their work to possible variations and stressors, such as climate change. Updated understanding of how processes interplay in our complex Baltic ecosystem is also necessary. Student and organizer group photo. Most of the 16 lecturers stayed at least 24 hours on Askö which ensured opportunities for networking and further discussions. 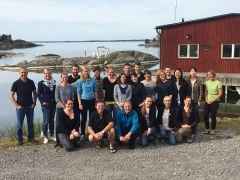 The Baltic Earth and BEAM programmes therefore arranged a one-week postdoctoral course at Askö Laboratory in August on how climate is connected to our commonly studied Baltic Sea research areas. To address stressors and ecosystem response, a holistic Earth System approach as well as key processes in meteorology, climatology, oceanography, marine and land chemistry and biology was presented. 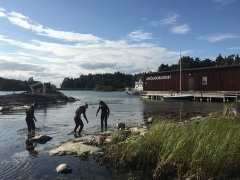 - Our course provided the students with interdisciplinary scientific knowledge on climate variability and ecosystem dynamics in the Baltic Sea catchment area, says the course leader professor Markus Meier. This kind of course is presently lacking in most Universities in the Nordic and Baltic Sea region and no single lecturer would be able to provide the expertise in all required disciplines. 16 expert lecturers with different expertise accepted the invite to teach at Askö. Below are their themes and each lecturer in alphabetical order. The lectures are available on film, just klick on the title to watch or listen. Between the lectures the course participants used the resourses at the field station. Snorkeling became a daily activity. The 20 participants on the course came from eight countries, and thus had diverse perspectives on acceptance and possible ways of promoting environmental management to the public and authorities in their respective countries. The discussions, group work and exercises therefore successfully reached a real-world atmosphere. The students debated solutions to issues such as eutrophication from many angles, as the participating countries in Helcom would. - The students listened to and vividly discussed the experts presentations, and had course work dedicated to specific questions, course leader dr. Marcus Reckermann explains. Also, the students had a task to draft a "research proposal" to be submitted to a virtual funding institution which gave them the opportunity to interact and collaborate across disciplines. All students presented their current work, both by giving speed talks and as one-minute-talks from their work with the 'message box'. Science communication was another important component of the course. All students developed a personal message box, which is a tool to simplify and describe the importance of something complex. There is great usefulness of such training in order to better convey a message to stakeholders and media, but also fellow researchers and funding agencies. The postdoctoral course: Impact of climate change on the marine environment with special focus on the role of changing extremes, was jointly organized by Baltic Earth and Baltic Ecosystem Adaptive Management, BEAM.